This bike has not any major problems. The LCD display is small, but it displays some useful performance data. There are no Bluetooth or connectivity features on this bike. The resistance levels are not hard enough for those wanting very challenging workouts. Some assembly required. Comes with clear instructions. So, the assembly is very simple. By this Exerpeutic Workfit 1000 Review, you will be able to know its features, positive, negative and also FAQ. Its price is very low yet this bike has some sound features. Most of all the features are very suitable for you. One of the great features of this bike is an adjustable desktop. You can use this desktop to put your laptop, tablet or phone. It has also 2 cup holders, storage holder and soft foam for your arm’s rest. It has large airsoft seat with backrest that’s perfect for 5’3” to 6’2” user heights. This bike has adjustable tension control system with 8 levels so that you can adjust easier to more difficult workout. It has 3 pieces high torque cranking system that provides smooth and quiet pedaling motion. It has LCD screen so that you can read distance, time, speed, calories burned, odometer, scan, and heart rate. You can also fold the bike when you finish the exercise. Hope this Exerpeutic Workfit 1000 Review will be very helpful for you so that you can find your best exercise equipment. 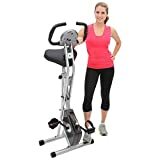 Before buying this machine please read this Exerpeutic Workfit 1000 Review. This Exerpeutic Workfit 1000 bike has an adjustable desktop so that you can use laptop, tablet or phone. You can move this at forward, backward; up and down and also adjust height from 41 to 45 inches. Also, you can adjust 0, 16 and 32-degree angles. It has a large working interface which is 16’’ L x 24’’ W and also its weight capacity is 44 lbs. It has 2 cup holders and storage drawer and also soft foam for your arm to take rest. This bike has a comfortable AirSoft seat which size is 11″ L x 15″ W and it’s 2.5 inches thick. The seat uses aerodynamic healthcare technology so that it can breathe air through the fabric. So the seat remains cool even you use many hours. The seat is adjustable and it’s also perfect for 5 feet 2 inches to 6 feet 3 inches user height. Also has a backrest which size is 15.5″ H x 11.3″ W and 1.3″ thick with cushion. This bike can tolerate 300 lbs weight capacity. It is also very easy to get on and get off on the bike. Therefore it provides a very effective and comfortable workout. It’s constructed with the steel frame and also coats with durable power. You will be able to use the desk as a standing desk when you will feel tired. You will be able to fold up this bike when you have finished your exercise. It has two transportation wheels that allow you to move all around easily. This exercise bike has a magnetic type of resistance. This magnetic tension control system is also adjustable to 8 levels. So you can adjust this tension level from easier to difficult workout as you’re comfortable. This bike has 3 pieces high torque cranking system. So you can get smooth and consistent pedaling motion. It has the precision balanced flywheel and v-belt drive due to getting comfortable and quiet pedaling. As a result, you will not feel any disturb to watching TV, listening music or doing other works. This exercise bike has an ultra-functional computer screen that is very effective for you. This display allows reading easily distance, time, speed, calories burned, odometer, scan and also heart rate. When you start pedaling the reading will turn on automatically and it will also turn off when inactive 4 minutes. In this bike have facilities to reset the modes. Hold the button for 4 seconds to reset all values without an odometer. This bike operates by two AA batteries which are bottom side of the desk. The larger pedals are designed with safety straps. So it can prevent any foot slippage when you exercise. Another great feature is 3 pieces high torque cranking system that provides smooth and consistent pedaling motion. Pedaling is very quiet that does not interface when you hear the television. QUESTION: Is this item refurbished? ANSWER: No. Everything I sell is brand new, factory sealed in a retail box. QUESTION: Is the seat comfortable when pedaling full speed? ANSWER: Yes. The sit is large and soft with backrest. You will feel comfortable when exercising. QUESTION: Could you use the bike on a carpeted floor? ANSWER: You can use the exerciser on a carpet, but it is better to place a mat under the machine. Sweat does not soak into your carpet. QUESTION: Can one peddle this bike backward? ANSWER: Yes. It has resistance when you pedal backward. QUESTION: Does this bike go to zero resistance or only down to level one? ANSWER: First resistance level of this bike is one and the number is really very easy as no resistance. QUESTION: Does it require power, or batteries? ANSWER: The computer requires 2 AAA batteries that are included. The control automatically shuts off if you stop peddling about 30 seconds. QUESTION: Is the seat comfortable for long sessions? ANSWER: Yes. The seat is enough large with a supportive backrest. Honestly, it is very comfortable. It is not any problem for long sessions. QUESTION: Is there a warranty on this bike? ANSWER: Yes, this exercise bike comes with a 3-year limited warranty. Wow. QUESTION: Does the seat adjust easily to a comfortable position? ANSWER: Yes. There are several notches to adjust the seat. It is very smooth to adjust the seat to your comfortable position. QUESTION: Does this hurt the knee and/or knee joints? ANSWER: No. This bike actually helps your joints. If you have any knee pain this is the best exercise for this because it doesn’t put weight on your joints like walking. Exerpeutic Workfit 1000 bike has an adjustable desktop and it has two cup holders, storage drawer and also soft foam. It has an adjustable airsoft large seat with a backrest. It has 8 levels adjustable tension control system and 3 pieces high torque cranking system. This bike has ultra functional LCD computer screen. It has high weight capacity, transportation wheels and it also foldable. This bike designs for short and tall people. Finally, this bike has good reviews, high rating, as well as the, recommends by the real buyers. So you will happy by using Exerpeutic 7150 bike depends on its useful features.